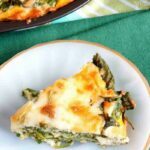 A crustless spinach cheese pie is a simple dish that’s perfect for those just starting out on a low carb diet. 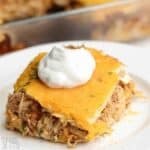 It can be baked in a pie pan or square dish. 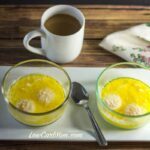 This past holiday week, I decided to enjoy some of the foods I typically stay away from during the year. Now that the New Year is here, it’s time for me to get back on track with my normal low carb diet. Have you fallen off the low carb diet wagon and trying to get back on track? 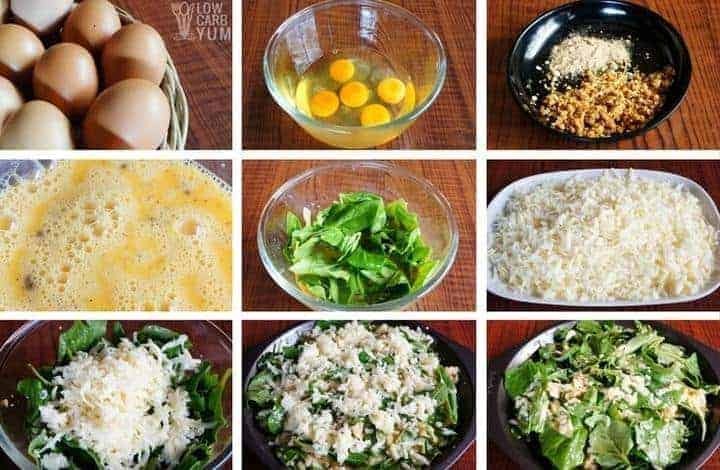 You can find some Low Carb Diet Tricks to Stay on Track over on All Natural Ideas. Although I did have a few of my favorite cookies and some regular eggnog, I kept the portions within moderation. My main meals were still kept low in carbs, but it is nice to have a few treats after being good all year. 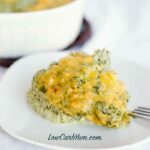 This low carb gluten free crustless spinach cheese pie is a recipe that I haven’t made in a long time. 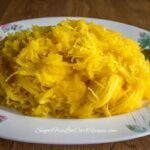 It’s a very simple dish that is great for those just starting out on a low carb diet. 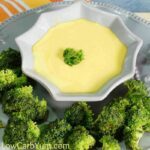 And, it’s a perfect dish to make during low carb induction. Although I like to make it in a pie pan, it can be baked in a square dish or doubled to fit into a 9×13 pan. 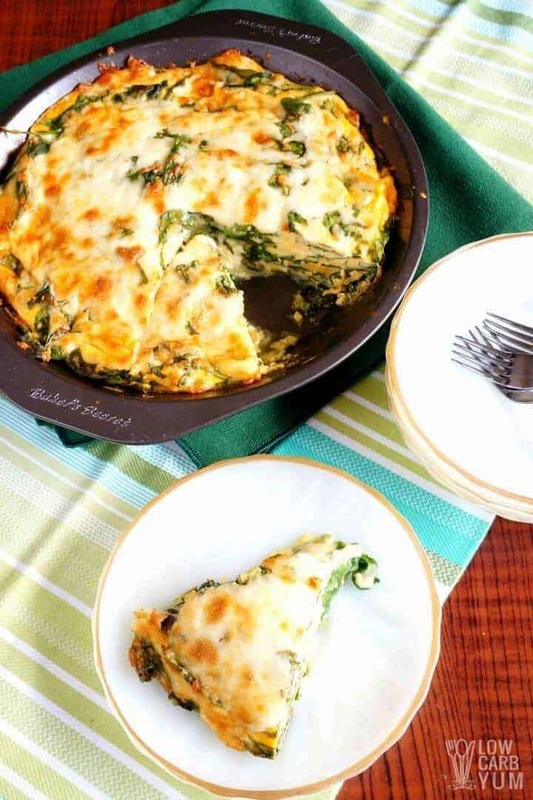 You may want to make this crustless spinach pie ahead for easy breakfasts or snacks during the week. 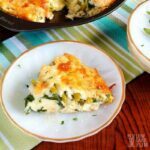 If you don’t mind the additional carbs, you could bake it in a savory pie crust for more of a quiche. 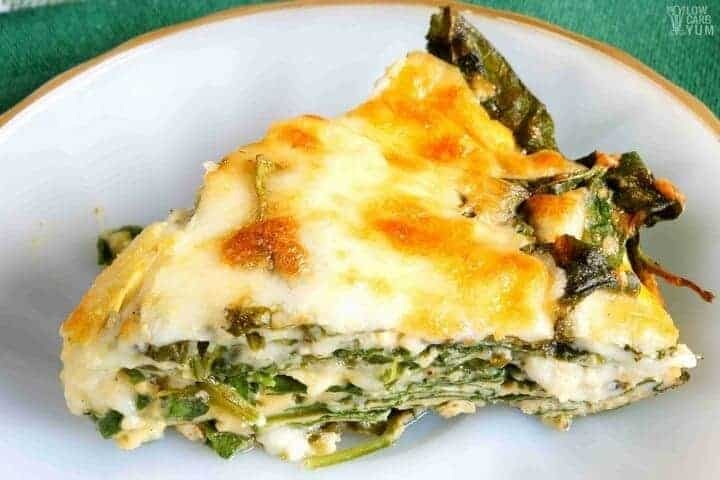 However, I like to eat this as a very low carb crustless spinach cheese pie. I suppose you could call this recipe a crustless quiche. 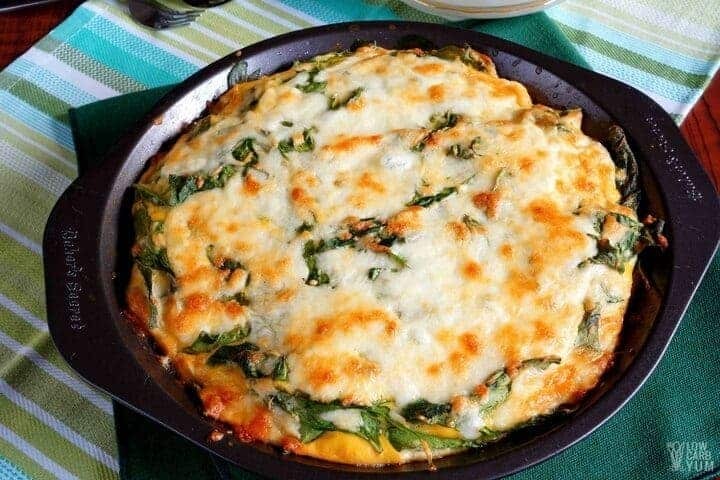 But, it’s loaded with spinach and cheese so I chose to call it a crustless pie. If you are looking for more of a quiche recipe, I’ve got a few of those on the site. You may want to check out my bacon cheddar quiche or my asparagus quiche. 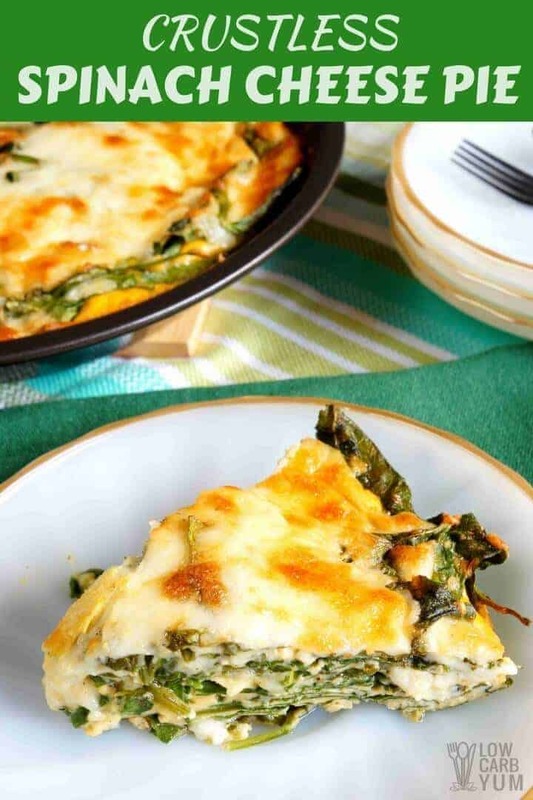 You can also freeze this crustless spinach cheese pie if you want to make a large batch ahead of time. Freezing in single servings also makes it easy to just grab a piece to reheat in the microwave. I’ll admit that I rarely have time time for doing freezer meals. Usually, I do most of my cooking on the weekend and eat leftovers during the busy work week. I enjoy cooking and trying out new dishes. Hopefully, I’ll have more time to experiment in the kitchen once I finally leave my regular 9 to 5 job. Right now, the blog and low carb recipe development is just a hobby. But, I may kick it up a notch soon as my kids will be entering college soon and we aren’t prepared for the added expense. I almost didn’t post this super easy spinach pie recipe. It’s one of those recipes you could just wing on your own without guidance. But, I remember there was a time in my life when I didn’t even know how to hard boil eggs. 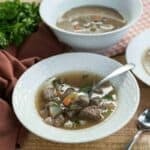 So I decided to share this simple recipe for those who need the extra help when cooking low carb meals. 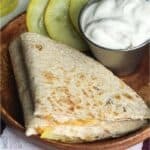 Do you have any old standby recipes you like to make that help you stay on track? It’s the recipes that require very little prep time that have kept me going over the years.